Naval Striking and Support Forces NATO (STRIKFORNATO) and Allied Maritime Command (MARCOM) co-hosted the 5th annual NATO Maritime Ballistic Missile Defence (BMD) Table Top Exercise at STRIKFORNATO headquarters this week with participants from NATO commands and nations. NATO say that table top exercise was a scenario-based exercise with the objective of building a common understanding of NATO maritime BMD operations. “This year, the exercise added a scenario showing how NATO will advance BMD in the coming years, as the United States executes phase three of the European Phase Adaptive Approach. By 2021, the United States will deploy new weapon systems and ships while upgrading communication networks to increase the lethality and capability of the NATO BMD forces. This exercise was critical in building understanding of how to effectively employ these new systems in support of the Alliance. 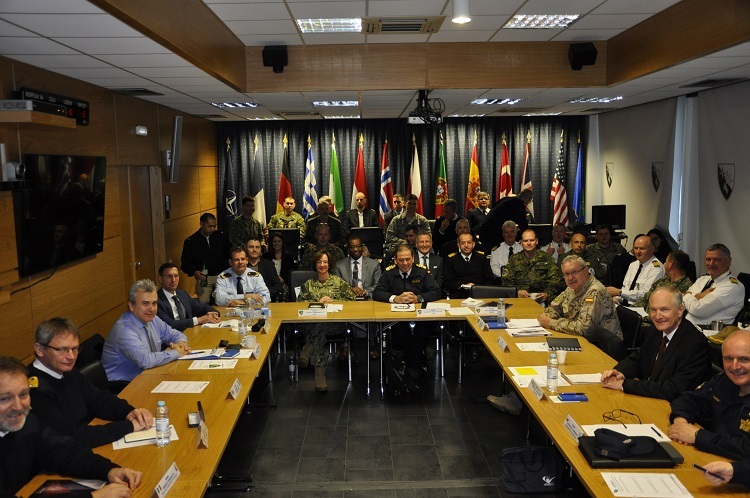 This event, with support from U.S. European Command (EUCOM) and the U.S. Missile Defense Agency, brought together NATO Senior Military Leaders, BMD experts from NATO, and other national leaders with interest in BMD, especially in the maritime area. Does anyone in NATO have any BMD capability apart from the US? I believe Aster has a BMD Capability and Type 45 has been mentioned on here before. Yes was aware of the possibility of T45 having it. I didn’t phrase my question correctly, I meant certified, proved in service ABM capability. I fear I know the answer already. Patriot was used in the Gulf, but that was only for Scuds I believe. NATO ( European nations ) really need to start relying on the US less. No wonder Trumps pissed. Morning Daniele, I really think our ABM capability is lacking especially when you consider how many new potential threats are emerging. What have we actually got ? As you said. The possibility of T45 Aster being modified? Daniele- The Dutch have trialed and proved the concept of ABM on their De Zeven Provincien Frigates (major upgrades in the pipeline) but as a routine capability its a few years off yet.If a scenario pans out that the Brown stuff hits the Fan its not a quick and simple modification to do for the Countries that posess the potential to do it I would have thought. Ah, Dutch too possibly Paul. The French and Italians have a limited capability with their Aster30 block1 land system,nobody else does just some radar tracking capability.The Astor 30NT in development will have the ability to intercept 1500 km range Balistic missiles around the mid 2020’s. Yea a brand new seeker, KA band AESA also new warhead with larger fragmentation sections,other mods to electronics fusing as well.There was a line in the new equipment budget about refreshing Astor in UK service so maybe we will get this new version then. Interesting comments Spy and GWM. Thanks.